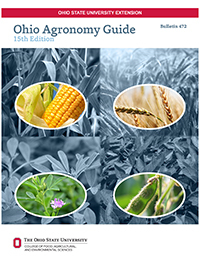 The agronomic crop scientists at The Ohio State University are pleased to present the 15th edition of the Ohio Agronomy Guide. First published in 1966, the Ohio Agronomy Guide continues to serve as the official compilation of adaptive research results and recommendations from research and educational program. Ohio agronomic research programs are designed to determine responses of various crops and cropping systems to management practices and resource inputs, as well as to underand the basic biological and chemical mechanisms responsible for these responses. This basic research thrust allows us to model cropping systems and predict their behavior under a variety of management schemes. Our aim is also to continue developing technologies and cropping systems that are efficient in capuring solar energy, sustainable over time, and environmentally compatible. The 15th edition contains updates to the previous publication. Additionally, three new chapters have been added: "Considerations for Using Cover Crops" (Chapter 10), "Conducting On-Farm Research" (Chapter 11), and "Precision Agriculture" (Chapter 12). We will continue to supplement the information in this guide with other publications and fact sheets as necessary. For additional details and assistance, contact your local county Extension educator or one of the authors. We welcome your suggestions and input for improvement of both this publication and our research and educational programs.